Recently old photographs of the Cardiff Giant surfaced on Twitter, and with them returned a few ancient memories of my own. On some long-ago family vacation, I clearly recall peering over a wooden fence into a pit to see the Giant himself. He left a considerable impression on my youthful mind, primarily because he was really big and he was naked. Whoa! But then the Cardiff Giant was designed to have that effect on people. The Giant was the creation of a New Yorker named George Hull. Hull, an atheist, concocted the plan in an I'll-show-them moment after an argument with a group of Methodists. The argument was over a passage from Genesis that stated giants once inhabited the Earth, which the Methodists accepted as fact, and Hull didn't. To prove his point, Hull hired artisans to create a monumental hoax. He arranged for a giant figure, about ten feet long, to be carved from gypsum in Chicago by a stone cutter sworn to secrecy, and in an extra twist of cynicism, Hull had the figure's face carved to resemble his own. Then he had the completed figure "antiqued" by beating and staining. Finally, Hull had the figure transported to the upstate New York farm of his cousin, William C. Newell, where it was secretly buried near Newell's barn. Then they waited nearly a year before hiring two local well-diggers to accidentally discover the giant in October, 1869. The stone figure was declared to be the petrified remains of a lost race of giants, and was dubbed the Cardiff Giant in honor of the nearest town. Word spread like the proverbial wildfire. Newell set up a tent over the statue, and charged 25 cents for a look. The crowds grew, and he raised his fee to 50 cents. Scientists and archaeologists denounced it as a certain fake. I particularly like the declaration by palaeontologist Othniel C. Marsh: "a most decided humbug." To modern eyes, it doesn't remotely look like anything but an amateurish 19th c. sculpture. Yet people believed in the Cardiff Giant because they wanted to. Fundamentalist Christians - the ones that had so irritated Hull - not only accepted it, but defended it, too. Wrote one well-regarded pastor from nearby Syracuse: "Is it not strange that any human being, after seeing this wonderfully preserved figure, can deny the evidence of his senses, and refuse to believe, what is so evidently the fact, that we have here a fossilized human being, perhaps one of the giants mentioned in Scripture?" The only true "wonderfully preserved" thing to emerge was Hull's bank account. While he reportedly had spent over $2,000 to create the hoax, he was reaping a fortune thanks to the gullible public. Finally he sold his share of the giant in 1869 to a syndicate led by showman David Hannum who paid him $37,500 (nearly half a million dollars in modern money.) They trundled the Giant off to Syracuse, where he could reach a wider audience and earn even more money. So great was the Giant's appeal that another showman (the king of showmen, really) P.T. Barnum offered $150,000 for the figure. Hannum and his partners refused. Barnum not only promptly created a fake giant of his own, but declared that his was the genuine Cardiff Giant, and that Hannum's was the fake. Hannum sued Barnum, much to the delight of the newspaper-reading public. But the end was coming. Hull confessed the Giant was a fake. On February 2, 1870, both giants were declared to be fakes, and the case dismissed. 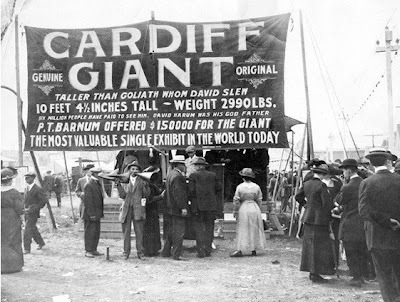 The original Cardiff Giant ceased to be a marvel, though he was still attracting the curious well into the 20th century, above. Eventually he ended up in The Farmer's Museum in Cooperstown, NY (not far from the Baseball Hall of Fame), which is where I saw him. Much more lasting, however, is a comment made at the trial by David Hannum, and ironically it's more often attributed to P.T. Barnum: "There's a sucker born every minute." Can there be any better legacy for the Cardiff Giant than that? Photographs courtesy New York State Historical Association. 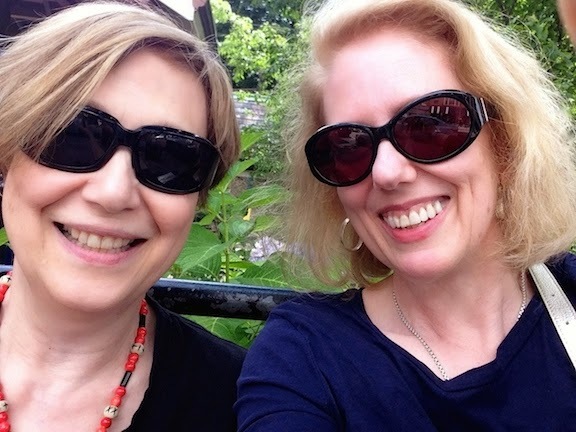 What a wonderful story! Thanks so much for sharing it! I actually find it rather nice that people did, and still do want to believe in the fantastical! It makes life a little more fun, as long as you don't get too upset when it proves false! Fascinating stuff. Thanks for the post. There is a book called "Fantastic Archaeology" that includes a chapter on this...really an interesting read!